With a smooth and glossy finish, this blue and white cherry blossom bowl with lid comes with an airtight plastic lid that has a open and close switch in the center to allow the bowl to vent. Perfect for steaming, this personal size bowl with lid is perfect for taking to work and enjoying a quick bite of packaged ramen. Simply pour in hot water, cover with the lid and allow your instant ramen to cook! Not only for instant ramen, this cherry blossom bowl is also great for salads, stews, and other delicious leftovers form home. 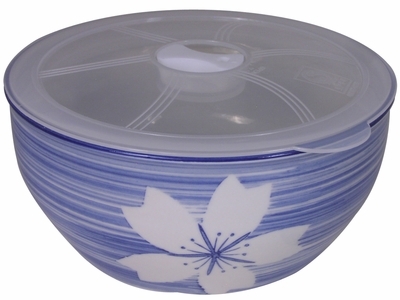 Made of ceramic, this bowl with lid comes packages in a paper box perfect for gift-wrapping. Made in China. Microwave and dishwasher safe.